Girlpool's What Chaos Is Imaginary comes out Feb. 1 via Anti-. When Girlpool emerged, it kept its yearning, hummable heart encased in punk scaffolding. 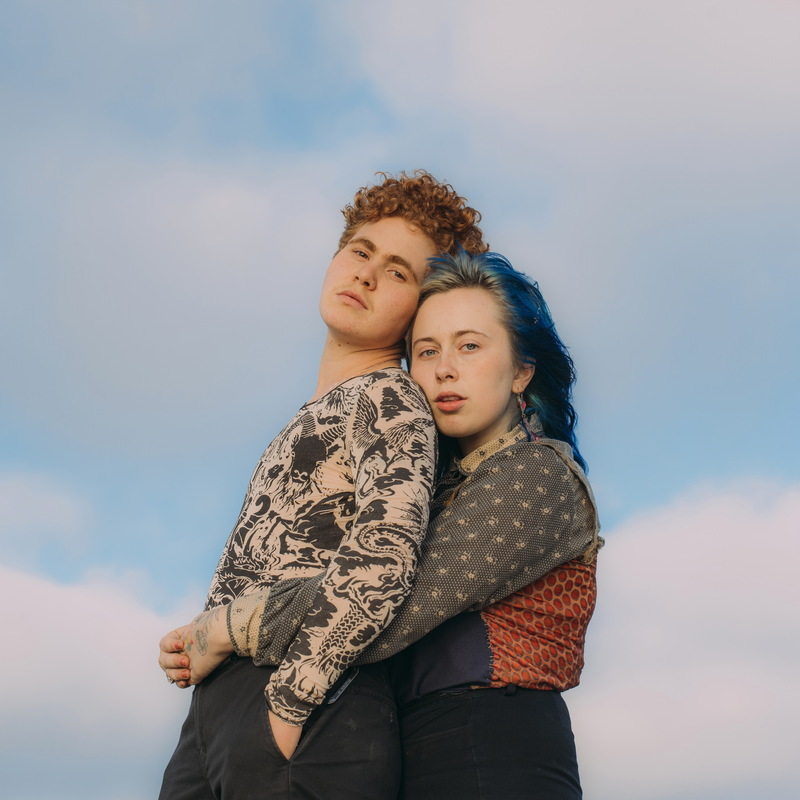 Harmony Tividad and Cleo Tucker were just 18 and 17, respectively, when they met and became best friends; Girlpool's self-titled debut EP came out just three months later. That EP and Before the World Was Big, the duo's first album, contained simple elements: guitar and bass; two powerful voices, singing (and shouting) often in unison; lyrics that explored being a young, complex, changing person in an equally complicated and uncertain world. "Do you feel restless when you realize you're alive?" they sing with inquisitive vigor in "Chinatown," an early hit. Perhaps that formula could have held forever, but Girlpool didn't ask it to. Its next album, Powerplant, expanded the band's sonic scope, adding a drummer, new guitar textures and playful dynamic changes. It's a trajectory that has continued on What Chaos Is Imaginary, a meditative and expansive album that showcases Girlpool's restless desire for growth. In press materials, Tucker said the duo used to "build our songs together with four hands, from the ground up." But that process has changed since Before the World Was Big; the two have spent time living in different cities, even working on solo music between Girlpool albums. The result is that the songs on Chaos hang together more by a common ethos than by the presence of overlapping voices. It's clear on the album, even when you can tell whether one musician or the other took the lead on a specific track — which you can, for perhaps the first time in Girlpool's discography — why these two songwriters have consistently chosen to collaborate with each other. They share an ear for crafty melodies, a sense of musical curiosity and a commitment to intense questions about themselves and the world around them. Chaos is marked by a range of styles: Beautiful muted reflections ("What Chaos Is Imaginary") sit alongside mid-tempo low-self-esteem jaunts ("Lucky Joke") and the band's most straight-ahead rock songs to date ("Hire"). In older material, Girlpool's instrumentation could sound charmingly amateurish; this is no longer the case. Chaos boasts drum machines, synths and strings, languid melodies and careful harmonies and a sweeping range of tones and textures — the sounds of a band wanting to make grand moments grander and intimate ones increasingly elegant. "Roses" closes the record on a slow and spacious note, its murmured vocals and churning guitars overlaid with delicate picked notes reminiscent of slowcore titan Duster (whose reunion show, incidentally, Tividad opened for last year). The title track showcases the benefit of a little distance between the songwriters: In it, you hear Tividad's sweet, high voice alone, sounding especially poignant on an album where loneliness, strife and isolation are central themes. Part of what makes Chaos sound different is the sheer quality of Tucker's voice. In 2017, Tucker came out as transgender and began hormone replacement therapy that included taking testosterone, which caused his voice to deepen. "I think the hardest part" of this change, Tucker said in an interview, "is feeling like my own voice is foreign to me." There's a sense of isolation — from the self, from the past, from others — across the record. Chaos revels in loose, poetic turns of phrase and imagery that feels cutting at the core but hazy around the edges. "A scene I kept dreaming made me swollen then sharp," Tucker sings in "Lucy's." "I wanna try to be a ribbon in a puzzle mind," Tividad sings in "Where You Sink." That idea of sinking comes up in multiple songs, and the album feels mired in the complex realities of facing down a broken world and trying to form relationships within it. Tucker refers to his process as his "gender flow" — a term that avoids the binary linearity that a more conventional word like "transition" implies; it's a term that perhaps more empathetically reflects the tangled reality of life. "How to explain," Maggie Nelson writes in her 2015 memoir The Argonauts, "in a culture frantic for resolution, that sometimes the s*** stays messy?" Nelson was referring to her trans partner's complicated relationship to these mainstream linear narratives, but she was also discussing words themselves: how pinning all of our individual experiences of life down into shared language can often feel impossibly chaotic. In the band's early days, it faced this challenge with the bravado of youth, but lately, the process sounds more measured, resolute and open-ended. What has remained at the heart of Girlpool's music is Tucker and Tividad's shared resolve to simultaneously revel in and make sense of the chaos of being alive.